Co-Owners April and Kelly have been doing hair about a combined 35 years. 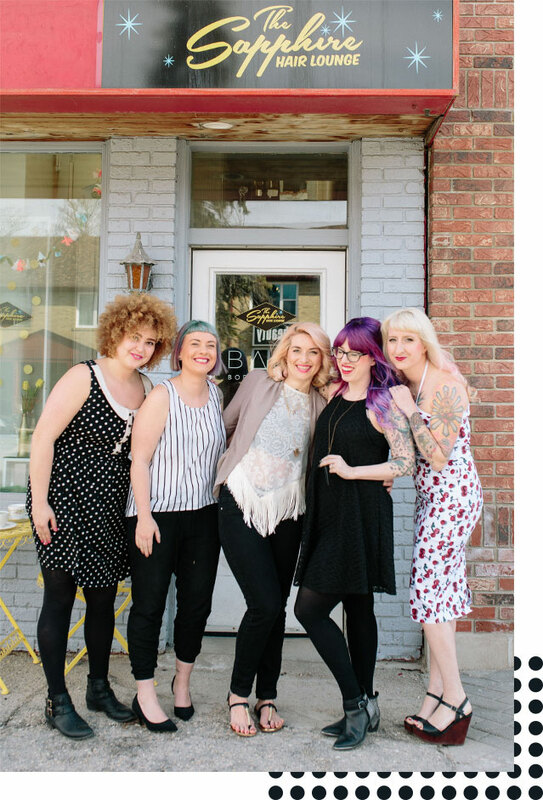 They have a passion and love for hair and making peoples dreams come true. Rounding out the team, we have stylists Jasmine and Lorie. Now as if this wasn’t amazing enough we have the incredible Karla, who is available on call for all of your makeup needs! It is our goal for you, the client, to have a special experience, where your wishes become a reality. Our talented stylists have continued education and have the knowledge to get you where you want to be, without comprimising the integrity of your hair. We want your hair to look fabulous, luminous and healthy. We decided to go look at some old vintage hair equipment at what was Stano’s Coiffeurs. Upon coming into the space we fell in love with it. Vintage, retro and AMAZING. So what was talked about via text quickly took form in becoming our baby. What came next was some elbow grease and The Sapphire Hair Lounge quickly became what we envisioned. It is the perfect mix of modern and vintage, where truly whimiscal hairstyling takes form. We want you to be the next beauty featured on our Star Photo Wall!